The College of Visual and Performing Arts (VPA) has announced the establishment of the Ginsburg-Klaus Post-M.F.A. Engagement Fellowship. The academic, yearlong fellowship, which includes a residency in San Pedro, Calif., is funded through a gift by VPA alumna Marylyn Ginsburg-Klaus ’56, G’57 and her husband, Charles Klaus ’07, who both serve on VPA’s Advisory Council. Graduates of VPA’s master of fine arts (M.F.A.) degree programs in the Departments of Art and Transmedia are eligible for the Ginsburg-Klaus Post-M.F.A. Fellowship, which includes housing in San Pedro, a stipend and the opportunity to teach at Marymount College in San Pedro. Ginsburg-Klaus owns Grand House Management Co., the Whale & Ale and the Grand Emporium in San Pedro, a growing artists’ residency location where she and Klaus are deeply involved in the art and commerce communities. In 2010, the couple founded the Ginsburg-Klaus Art in Los Angeles Practicum Week, which allows a group of students in VPA’s Departments of Art and Transmedia to undertake an intensive investigation of art collections housed in the city’s most significant museums, as well as visit galleries and contemporary artist studios to hear from prominent artists, curators and gallery owners, many of whom are accomplished SU alumni. 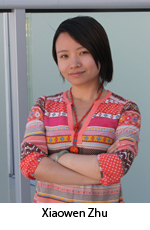 VPA has announced that the inaugural, 2012-13 fellow is Xiaowen Zhu G’12, who graduated from the Department of Transmedia’s art video M.F.A. program in May. Zhu uses video to explore her interest in the change of personal perception in a global nomadic context. Much of her work deals with the motivation and reflection of going/existing elsewhere and the in-between space of a culturally complex environment. Zhu currently teaches for Marymount’s Division of Arts & Media and is the co-manager of Marymount’s Arcade Gallery, where she is presenting the solo exhibition “There Is No Why” through Sept. 25. The exhibition features videos created over the past four years that span five countries and three continents. Zhu, who earned a bachelor’s degree in film, television and media art from Tongji University in Shanghai, China, has exhibited her work in cities around the world, including Syracuse; New York; Chicago; Rotterdam; Istanbul; Berlin; Munich; Florence; Norwich, United Kingdom; Shanghai; Toronto; and Athens. To learn more about Zhu and see examples of her work, visit http://www.zhuxiaowen.com.